Exhibition Of Paintings By Lavanya Dutt is an event that took place between 14-Apr-2007 and 28-Apr-2007 in Hyderabad. Lavanya Dutt is debuting with abstract. If you did not understand that, do not let it affect your self-acceptance. It happens to all of us. Shrishti Art Gallery is organising an exhibition of paintings by Lavanya Dutt, from 14th to 28th April. A collection of about 22 abstract paintings is on display. Dutt, who has been into figurative paintings for a while, is debuting with abstract. Dutt's latest paintings are in a vibrant and colorful palette. 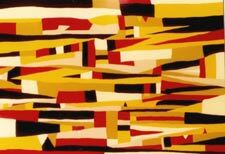 Her abstracts are random, yet organised patterns of geometrical shapes interestingly juxtaposed to create a visual vocabulary beckoning the viewer. A mosaic of shapes and forms, the latest works in acrylic and oil on canvas bring out the creative impulses of the artist. The bright colors like red, russet, blue and yellow, almost rhythmically blended, are visually arresting. Lavanya Dutt was born in a family of artists in Hyderabad. Her father, Prof Manmohan Dutt, is a painter and filmmaker, and mother Nirmala Dutt is a practicing artist. Dutt was a Gold Medalist in M F A (Painting) from Jamia Millia Islamia, New Delhi. She got a first class in her P G Diploma in Television Production from Central University, Hyderabad. She obtained the Central Scholarship from Jamia Millia University, New Delhi, and worked for an installation project from the same university, under the guidance of Vivan Sundaram, a renowned artist. Dutt has participated in solo exhibitions from 2000 to 2004 presented by the International School Of Hyderabad, the Daira Center For Arts And Culture in Hyderabad and the Alliance Francaise de Hyderabad. She also participated in several group exhibitions from 1993 to 2005 such as the All-India Art Exhibition of Hyderabad, the Annual Exhibition of the Dhoommimmal Gallery in New Delhi, the Retrospective Art exhibition at the 25 years of Alliance Francaise in Hyderabad celebrations, and the Young Artists of India and Women Artists of India exhibitions presented by Shrishti Art Gallery of Hyderabad. For further details, please contact the art gallery at 2354-0023/2360-7151. Be the first to comment on Exhibition Of Paintings By Lavanya Dutt! Just use the simple form below. fullhyd.com has 700,000+ monthly visits. Tell Hyderabad what you feel about Exhibition Of Paintings By Lavanya Dutt!